WASHINGTON - The U.S. Equal Employment Opportunity Commission (EEOC) today announced that registration has officially opened for its 17th annual EXCEL training conference on employment discrimination prevention for both the public and private sectors, to take place Aug. 12-14 in San Diego, Calif. 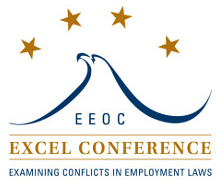 Examining Conflicts in Employment Laws (EXCEL) is the EEOC's premier training conference for professionals and includes separate agendas for the federal sector and private sector, which includes state and local governments. The comprehensive training workshops and events are geared toward EEO managers, supervisors, practitioners, HR professionals, attorneys, ADR specialists and other interested parties. Further details about the conference, including the agendas, pricing information and online registration are available at www.eeotraining.eeoc.gov/EXCEL. Registration information may also be obtained by calling (202) 663-7210 or via e-mail: eeoc.traininginstitute@eeoc.gov. The theme of this year's EXCEL conference honors the 50th anniversary of the landmark Civil Rights Act of 1964: 50 Years of Title VII, Celebrating Workplace Equality and Justice for ALL: the Mission Continues. The EEOC is responsible for enforcing laws prohibiting employment discrimination in the public and private sectors. Additional information about the agency can be found at www.eeoc.gov. Follow the EXCEL Conference on Twitter at @EEOC_EXCEL.